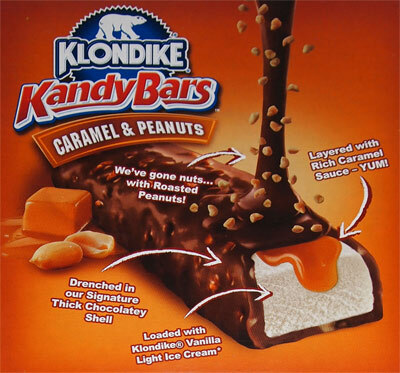 [2014-2017] Ok, the Cookies & Cream kandy bar was a long shot for a win, I get that, so let's try something a little easier to pull off, something that's been attempted before. Sorry, I forgot to show the back of the box last time. Ok, looks good enough, and sure enough, on that first bite, I like it. It tastes (and smells) like I'm eating peanut butter ice cream and that's a real plus (and something that was lacking on the C&C version). 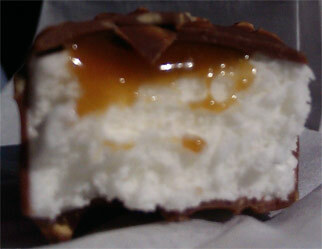 Sure it's no Snickers ice cream bar, but I'm still enjoying it enough now that it's on sale at $2.50 a box. See, there are flaws ofcourse. The ice cream is very light and airy so there's a certain lack of satisfaction when you eat it. The lightness also encourages inhaling instead of savoring (at least for me). Plus, there is still a weirdness to the sauce they use. It has a very artificial nature that leaves a strange taste (and aftertaste) in your mouth. It's not terrible, but all the food science does take away from this classic flavor combo. Let's put it another way, after finishing the first one, I actually want to eat another one this time! On Second Scoop: Ok, a few hours have passed, so let's see how this next one goes... yup, I still like it. It's almost got a cracker jack vibe to it. Sure it still has a certain funk to it, but the overall flavor is decent as the pros outweigh the cons enough for me to say that if you've interested in trying this one, go for it. Update: The Fudge Krunch bar (review here) winds up being the best of the three. This looks similar to Skinny Cow's Salted Pretzel bar that came out last year. Is this better than Skinny Cow's? I just tried this last night and I thought it was pretty good. 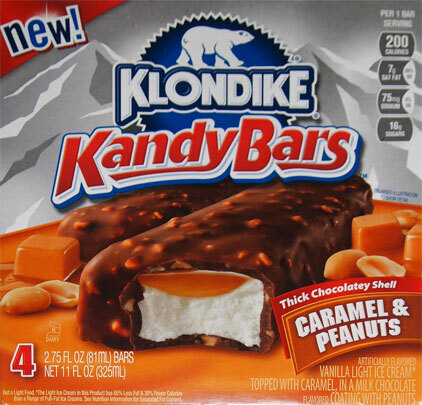 Much more fun take than a Klondike bar. But I did agree with you Dubba in that the shell is uber thin!